I am a serious sweet potato nut! My husband and I often joke about my addiction to root vegetables, and sweet potatoes are my favorite. While I'm partial to the white-fleshed Japanese/Korean sweet potatoes (which taste like a cross between sweet potato, potato, and chestnuts), I also love the classic orange-flesh kind and am always interested in different ways to cook with it. So is it any wonder I've wanted to make sweet potato soufflé for some time now? With root vegetables like sweet potatoes taking center stage during the fall, and with Thanksgiving on the way, I thought it was a good time to give it a go and my family and I enjoyed the delicious result at lunch last weekend. It was a few months ago that I ventured into savory soufflés with a cheese soufflé that turned out wonderfully delicious. 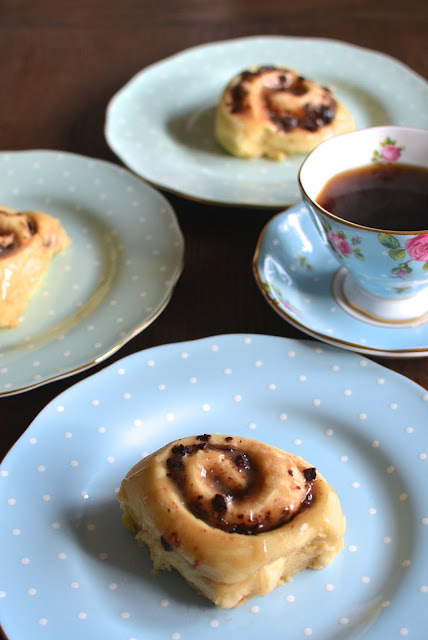 It made me want to try other kinds beyond the classic dessert variety (though I do love those!) and I think this sweet potato one was a great way to continue that idea. Now, would this be considered a sweet or a savorysoufflé? It's a bit of both; while it's not your classic dessert soufflé, there is definitely sweetness both in the natural sweetness of the sweet potato as well as from some maple syrup we add into the mix. Specifically, taste-wise, you clearly get the sweet potato as well as that natural warm fluffy "egg-ness" and texture expected from any soufflé. My family and I enjoyed it a lot. I find that I'm partial to the warm, custardy center of a soufflé (it's a bit like the sensation of digging into the center of a molten chocolate cake) but the firmer edges add such a great contrast in texture. There's really so much to love about a soufflé, whether it's a sweet or savory one. I'm convinced they're all delicious and we should eat as many as possible! 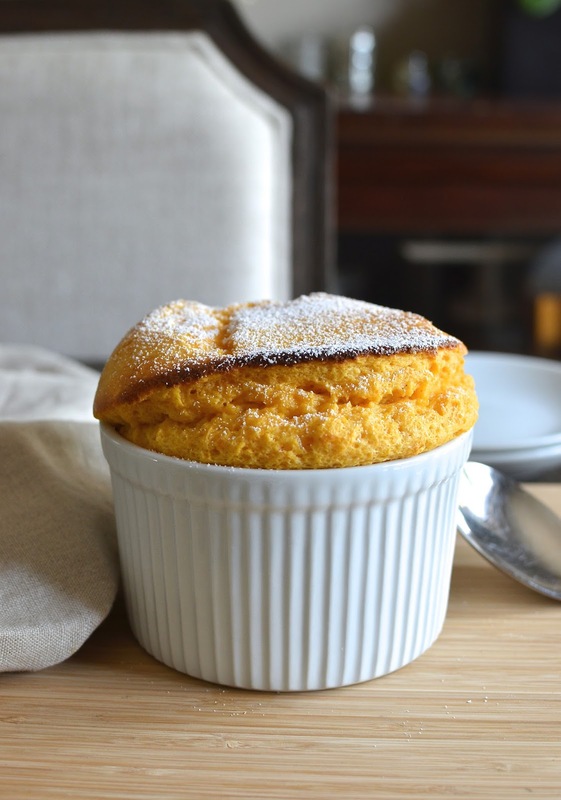 And I imagine you could turn this sweet potato soufflé into a pumpkin one if you're inclined. There is a world of possibility for those who want to experiment. I think if the last post for soft chocolate molasses cookies gave off Christmas vibes, I was going for an afternoon tea theme with this one. 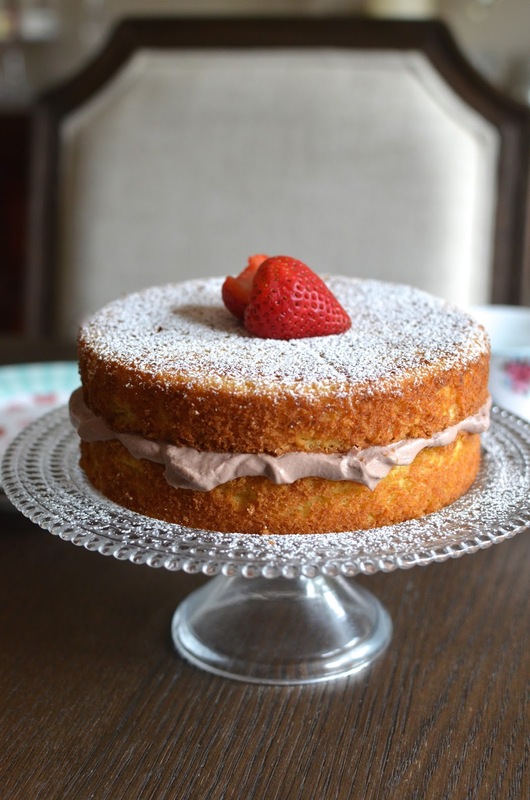 That's basically because this is a Victoria Sponge - the classic English cake often served at tea time or at a special occasion or celebration. Traditionally, the classic Victoria Sponge (or Victoria Sandwich) is two layers of sponge cake filled strawberry jam and whipped cream. You might see variations using a different type of jam, some including fresh fruit, and maybe even buttercream instead of whipped cream. I took my own liberties and filled this little 6-inch rendition I made with cocoa whipped cream. 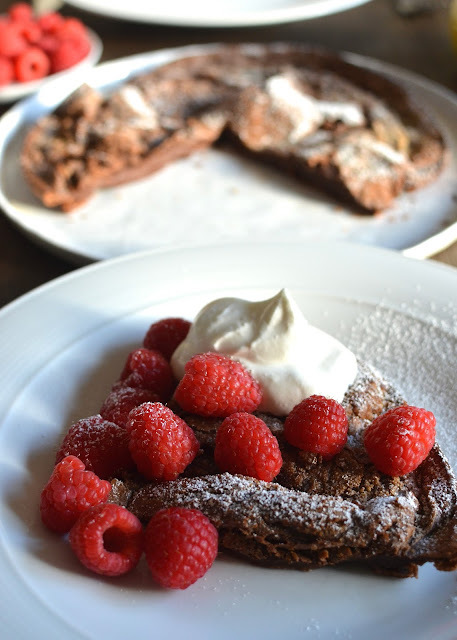 In my book, why use regular whipped cream when we can make it chocolate? These chocolate molasses cookies gave me Christmas vibes. I hope that thought doesn't make you cringe; I know it's not even Halloween yet and we're in flux in general these days because while the fall foliage outside clearly tells me it's autumn, the recent 80-degree days leave me a little unsettled. I do have Christmas on the mind though - not only because I love the holiday but because I'm contemplating the thought of not baking or cooking a lot during the holidays. Timing is uncertain but we might be doing a kitchen renovation in the next month or so. It's probably more likely that work won't begin until the new year but the possibility of not having a functioning kitchen in December does exist. I have mixed feelings about it and I'll just wait and see how things work out and what we decide. Since our kitchen is small and we're not making any major changes beyond updating the old with new, it will hopefully not be a big or long endeavor. It's fair to say I'm comforting myself by baking up some Christmas-like cookies right now! 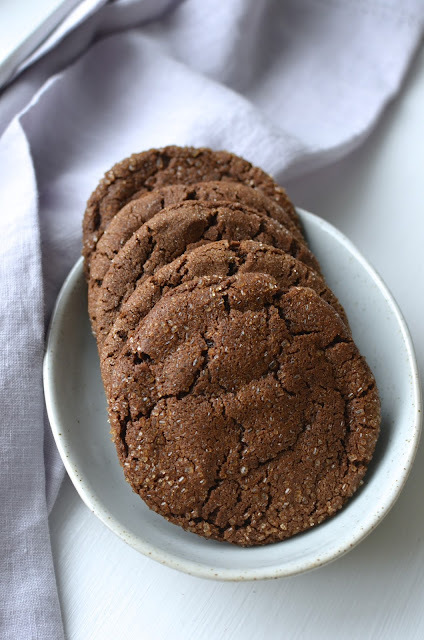 I went into my recipe archives and dug up this recipe - a very easy one you can simply whisk together for a batch of soft chocolate molasses cookies. I couldn't decide what type of sugar to roll the cookies in so I used plain granulated sugar and experimented with turbinado as well as sanding sugar. The turbinado gives the greatest crunch while the granulated sugar is subtle, with the sanding sugar being a nice mix of the two. 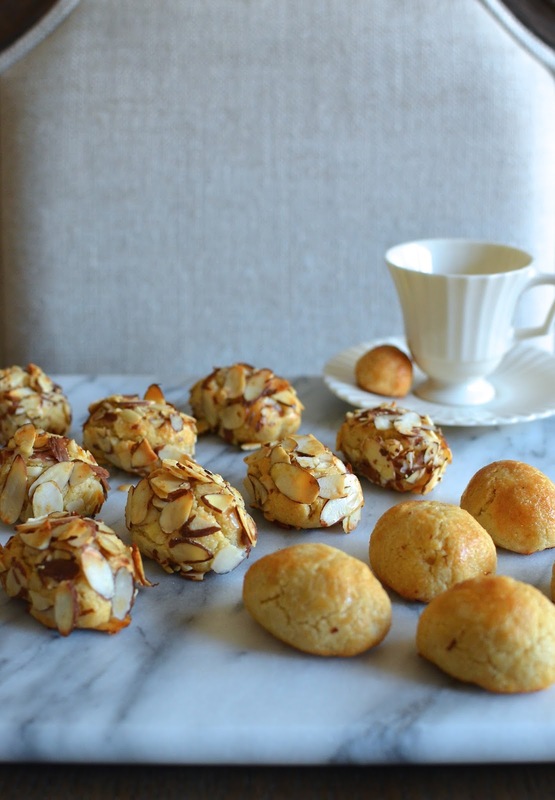 These cookies are slightly under-baked and meant to be soft and slightly more dense and chewy in the center. 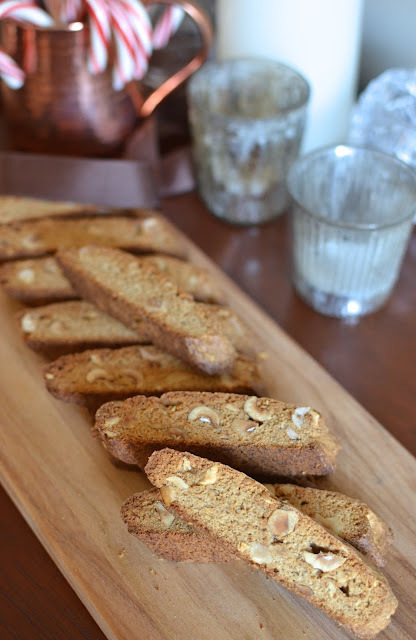 The molasses flavor conjures up gingerbread and holiday spices. And I think the chocolate/cocoa component adds a richness and depth of flavor that is always welcome when it comes to treats. I definitely feel better after making and eating a few of these! 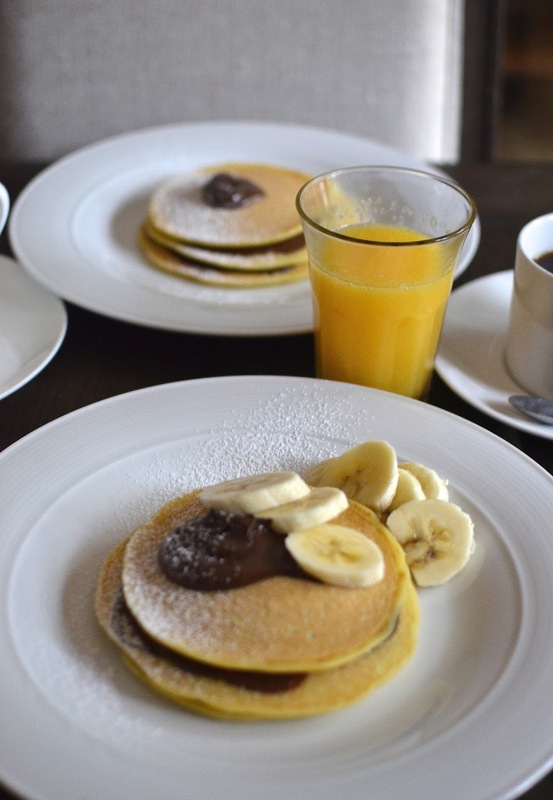 I love weekend breakfast/brunch so it's always fun to try new recipes to serve up for that first meal of the day. But that said, I have to tell you...I would have made these pancrepes simply so I could say the word, "pancrepes" over and over again. What a great name! I spotted this recipe from Ayesha Curry's cookbook. Whenever I pick up a new cookbook, I gravitate towards the dessert and the breakfast sections first. 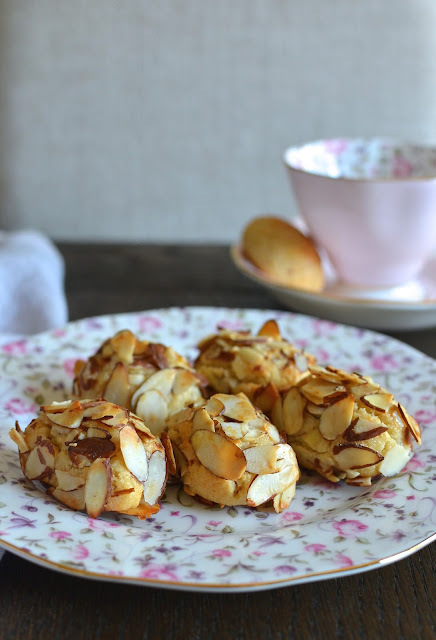 The title of this recipe - pancrepes - got my attention and made me smile. I don't know how many other pancrepe recipes there are out there but this one apparently happened with Ayesha Curry left the baking powder out of a pancake recipe and enjoyed the result. And basically, this is a pancake recipe without the leavening. I was tempted to make a few changes - i.e., use butter instead of olive oil, sugar instead of honey, and vanilla extract instead of almond - but in the end, I figure I'd try the recipe exactly as written. So I made a small batch a couple of weekends ago to try with my family; it was fun announcing we were going to have pancrepes for breakfast over and over again, and we were curious to try it. And the result was interesting...the pancrepes are very much a denser, thinner version of pancakes (though thicker than crepes). Texturally, it's chewy. In a way, it reminded me somewhat of Asian-style glutinous desserts because of that chew. If you like that kind of chewy, dense texture, you'd likely find it oddly addicting like I did. But if you are looking for moist, fluffy, feather-like pancakes in thinner form, this is not that and I think it's important to have realistic expectations. Ayesha Curry serves up her pancrepes with a raspberry sauce and granola. When I think crepes, I think chocolate-hazelnut spread and bananas so that's how I choose to serve my pancrepes at home. I don't think maple syrup would be enough here in the sense that these heftier pancrepes need a heartier pairing. My sister recently brought me a jar of Venchi chocolate-hazelnut spread from her summer trip to Italy and this was a perfect opportunity to pop it open. These were described as not only being a textural mix between pancakes and crepes but like the bottom part of a Dutch baby. I admit that got me excited because I make a Dutch baby pancake for breakfast about every other weekend; it's one of one of our favorite things! After making these pancrepes though, I'd have to say that a Dutch baby bottom is far more moist and custardy than these, which are more dense and chewy. My family and I kept saying "okay...it's good; we like it..." without a strong sense of commitment though everyone cleaned their plates. Ultimately, I think we enjoyed these as a fun change. And more importantly, I got to say pancrepes over and over again like I wanted to. I still think it's a genius name! Have you heard of 3-layer "magic" cake? I hadn't until a couple of weeks ago when I saw it on POPSUGAR. That was when I found out about this cake where you make one batter and, "magically", it bakes up into three separate layers. 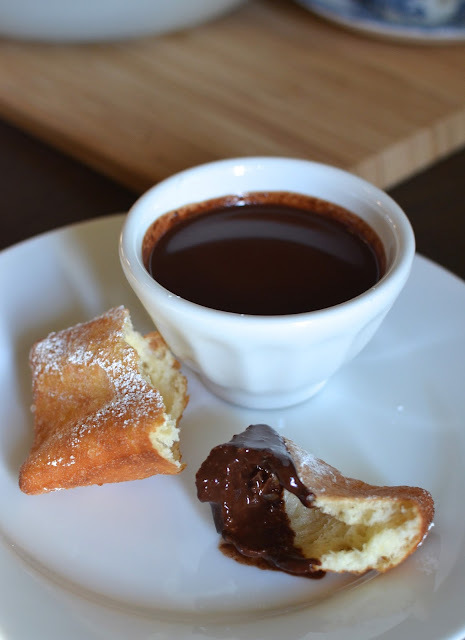 I wanted to give it a try and, naturally, I opted to make the chocolate version (there is an original one as well as other versions such as lemon and Nutella that you can check out from Jo Cooks). 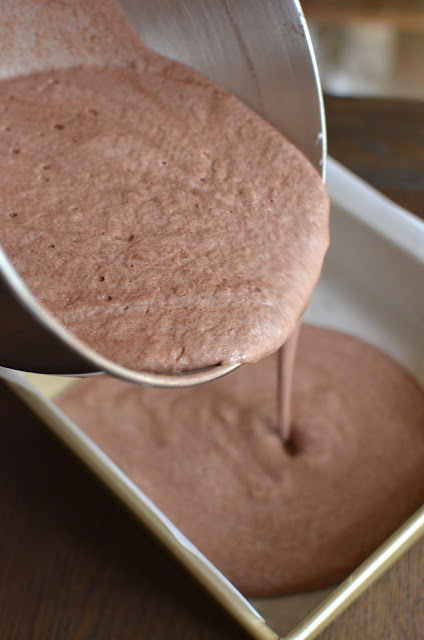 The batter sounded fairly easy to make (there are a few steps involved but any cake that doesn't involve frosting is comparatively simple to me) and I was just plain curious as to whether I'd really get 3 layers from the single batter. I thought it would be a neat trick to show my son. Well...I followed directions and made the cake batter, which involves incorporating separately beaten egg whites into a chocolate base that ultimately results in a thin consistency. And I did get 3 layers...but maybe my magic wand needs to go in for maintenance because my layers didn't quite turn out exactly as described. I was supposed to end up with: a top layer of sponge cake, a middle layer of custard, and a denser, somewhat "fudgy" bottom. It seems my order got shaken up a bit because while I certainly got that top sponge cake layer, the other 2 parts were flipped! I ended up with that darker, fudgy layer in the center and the custard was at the bottom! I've actually seen an image online that looks identical to the result I got; however, I have seen plenty of images of the "magic" cake how it's supposed to be. I am still feeling confused! Another thing that bothered me is the "skin" that formed at the bottom of my cake - similar to a skin that would form on a pudding. My husband insists he actually likes that but I removed it for the rest of us who preferred the cake without it. So this was an interesting experience that left me scratching my head a bit. It certainly was not a wasted effort because taste-wise, it was a good cake. My favorite part was actually my dark center - that thin layer was moist and the most chocolaty part of the cake. This cake tastes deceptively light and with that, the cake did do a magic act...by disappearing quickly! I'm not sure I'll be attempting this particular trick again but I sure would love to know if anyone has tried it and achieved a different result. Here I go with another muffin recipe! I make no apologies for my muffin-making addiction. 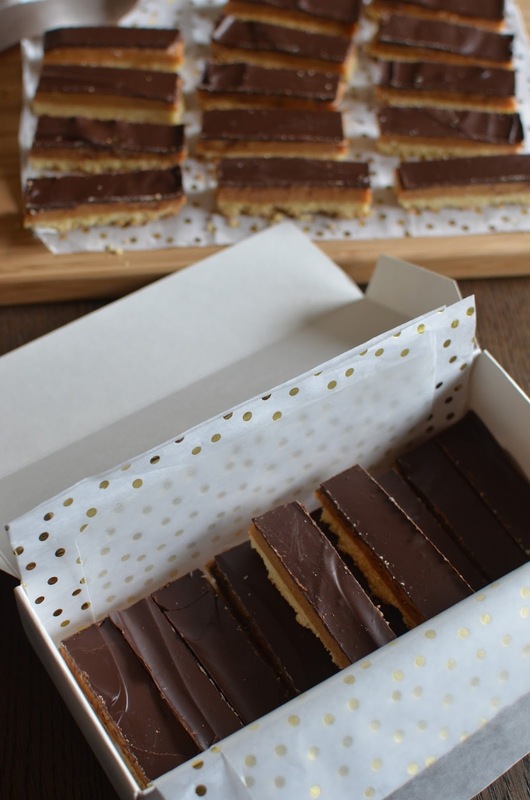 They are so gratifying to make and who can resist the occasional indulgence of eating a little cake first thing in the morning! So let's have a simple, classic chocolate chip muffin this time. I always keep an eye out for "back pocket" type recipes and they often fall in the category of muffins. These are recipes that I know everyone will generally like, that aren't complicated - built off a base of simple ingredients that I usually already have around so I can whip it up quickly. This simple recipe for chocolate chip muffins that I found in the Damn Delicious cookbook totally fit the bill. While I've baked and enjoyed more complicated muffins, sometimes you just want to grab a couple of bowls and a few ingredients from the fridge or pantry to make something simple. That's what we're talking about here. These muffins were actually titled "bakery style chocolate chip muffins" and that got me thinking about what makes muffins "bakery-style". To me, I tend to think of large muffins that are very crusty and brown on top. These aren't exactly what I picture but when it comes to bakery muffins, I think you also expect a moist and tender one that's also sturdy at the same time. 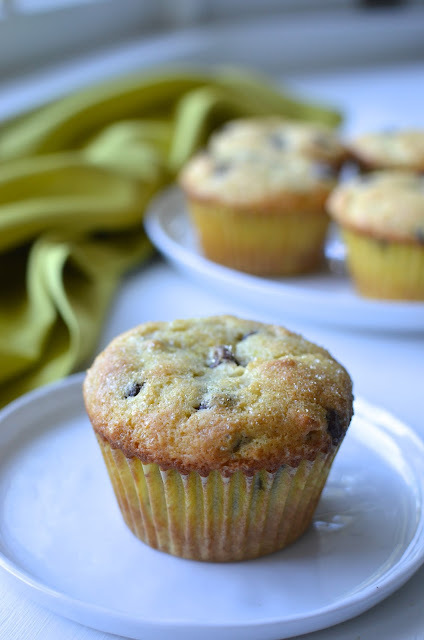 I think these chocolate chip muffins fall into that description and in general, they're tasty and simple, something you can make on a whim when you have a need or craving for muffins. I feel that need/craving quite often.